Travel to the West Rim of the Grand Canyon from Las Vegas on our luxury bus tour. See the Grand Canyon above, beyond, and below with a helicopter ride into the deep Canyon along with a ride in a pontoon boat. This tour includes a breakfast snack, deli lunch, and bottled water. See the Grand Canyon from top to bottom on a helicopter ride and on a pontoon boat trip on the mighty Colorado River. Your tour will begin once you climb aboard our lovely bus equipped with a restroom and entertainment for your convenience. We will pick you up from or close by your hotel. No need to go to a check-in terminal. We'll provide you with a light and tasty breakfast snack on board. You'll get an opportunity to stretch your legs on our first photo stop at the Hoover Dam. Afterward, enjoy an extraordinary desert scenery ride along the Mojave Desert en route to the West Rim. Upon arrival at the Grand Canyon West Rim, your first check-in will be at the Helicopter terminal. 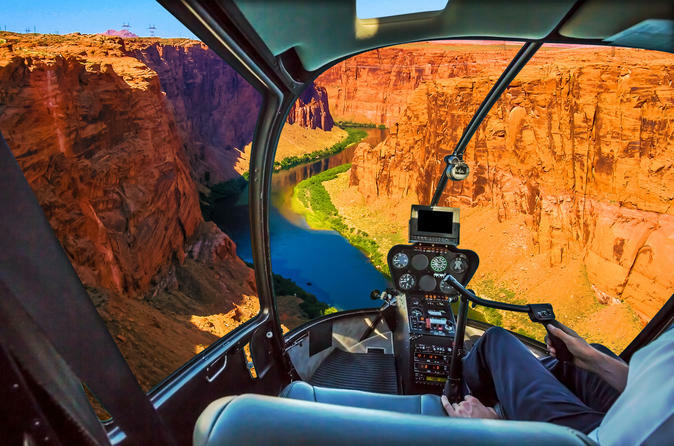 See the widest and deepest parts of the West Rim when you soar over the canyon. After that exhilarating flight, you will land at the bottom of the Canyon, and you will take a ride on a pontoon boat on the Colorado River. Once your boat ride concludes you will get back on to the helicopter, and it will take you out of the Canyon. From there you will jump on a shuttle that will take you to visit Eagle Point. This is where the Skywalk is located. Tickets are available for purchase on site. Your next interest points will include Guano Point and the Welcome Center. We will provide you with a delicious deli lunch and bottled water. After your tour is over you will ride back to Las Vegas on our luxury bus. Your average hotel arrival time is around 4:30 p.m. to 5:30 p.m.